They keep finding new places to kill zombies. It's only been a few weeks since Strange Brigade's first DLC mission was plucked from The Great DLC Tree and dropped into our waiting mouths. We've barely had time to digest all of its nutrients, and yet Rebellion Developments is already holding out another fresh batch of DLC for us to consume. "The Thrice Damned 2: Sunken Kingdom" is out now and offers up the the middle section of the game's DLC campaign. This time around, the adventurers are whisked away to an underground kingdom centered around an ancient temple. As with the previous mission, the party's objective will likely revolve around blasting holes into every undead creature in a ten mile radius. The other new DLC pack, "Japanese Naval Officer Character Expansion Pack", offers both a mouthful of words and Hachiro Shimizu, a master survivalist. He's armed with the Mikhailov 38-rifle, the Marchador TT pistol, a shock grenade, and the "Decaying Demon Blast" power. Both DLC packs can be purchased individually and are included in the game's Season Pass. 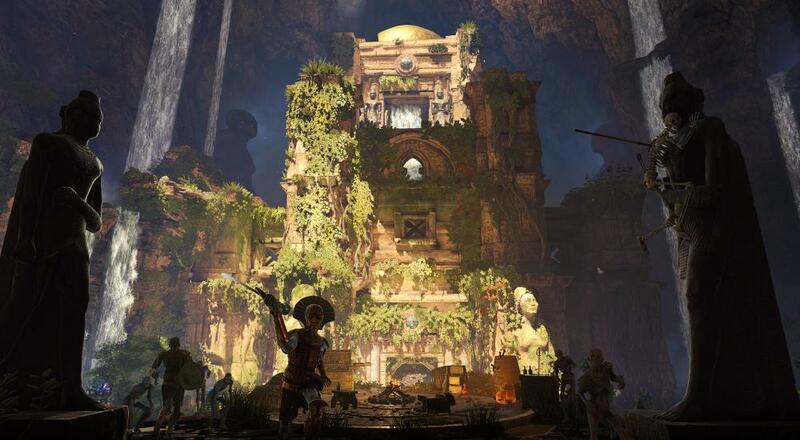 On the free side of things, Rebellion has updated Strange Brigade's Horde mode to include the Chamber map and the Score Attack mode to include Cut-Throat Caverns II and Forsaken City II. Strange Brigade's four player online co-op can be enjoyed on PC, Xbox One, and PlayStation 4. Page created in 0.4756 seconds.